Should my business use an Applicant Tracking System? In today's competitive and digital climate, hiring managers are relying more on the Internet, social media, online meetings and other ways to recruit and hire faster. When organizations take an effective and strategic approach to hiring, business goals are more readily brought into reach. Customer satisfaction is increased and the cost of hiring is reduced. One way to streamline hiring is the use of an Applicant Tracking System. Should your business use an Applicant Tracking System to attract and hire talent? Also known as an ATS, an Applicant Tracking System allows an organization to track candidates from recruiting through all stages of the hiring process. The ATS software handles all candidate and job related data, including job openings, resumes, notes and emails, in order to save time and money with a more efficient hiring process. Instead of different systems for recruiting, human resources, resume storage, and screening, an applicant tracking system integrates the process into a single paperless database. With less disparate locations of information, there is less chance of human error and greater productivity. How does an Applicant Tracking System work? With all of this information in a single, integrated system, employers have electronic records of each applicant that are easy to locate and store. The streamlined process also saves time and money during the hiring process. Where can I learn more about an Applicant Tracking System? iCIMS also offers easily accessible forms for new hires including applicant consent to background checks. With the VeriFirst integration, there is now an seamless transfer of the applicant's background check authorization status and screening results. Now hiring managers have an option for a unified and strategic process for hiring. Considering heavy competition in today's hiring market, many employers opt out of properly screening candidates and end up spending more money on bad hiring decisions. 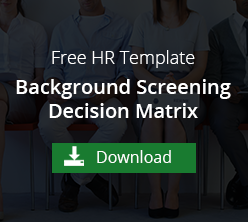 Human resources professionals need an option to make more informed hiring decisions and mitigate risk. An applicant tracking system may be the answer. Interested in a free iCIMS demo? Click here!